Alexa Bliss was beaming. It was the debut of her segment A Moment of Bliss, and no one was going to ruin it for her, no one. Not even the intern who forgot to get her coffee. She had good reason to be in a better mood than usual. Bliss lined up an amazing guest that not just anyone can book: Ronda Rousey. Fresh off the tag team match from last Monday’s RAW where she and Natalya took out both Nia Jax and Tamina, Ronda came out here no-selling Bliss’ handshake and summing up her experiences in the ring from last year. As it turned out, there was a new name on her mind. Bliss thought she was talking about her. We thought she was talking about Natalya. But before we could start processing any of this information, dry heaving squawked throughout the arena and Nia Jax walked out on stage pretending like she was about to throw up. 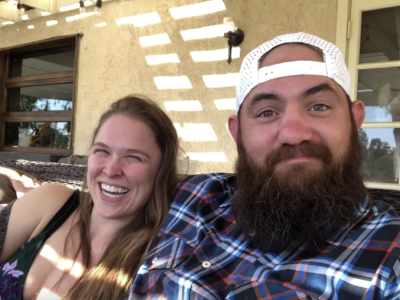 She accused Ronda of having a girl crush on Banks and worried that “The Baddest Woman On The Planet” forgot about her. It was almost sweet. Big surprise, she requested a rematch. Sasha’s ears must have been burning because she came out to see what was going on. She thanked Ronda and graciously accepted the challenge but Jax got even saltier. 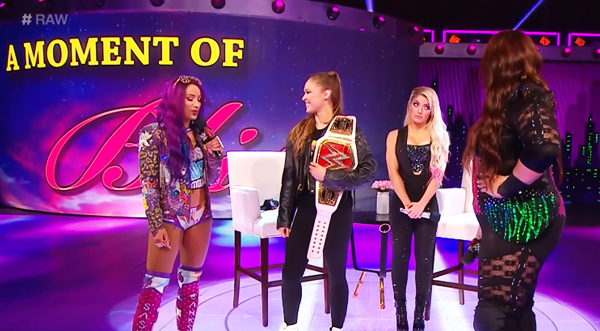 Luckily, there is always a way to settle these sort of disputes in WWE, so they wrestled to see who deserved the shot at Ronda right then and there. Surviving an absolute war and proving everything Ronda said about her correct, Sasha Banks came out on top and earned the shot at the RAW Women’s Championship. Will Ronda fall to her admirable challenge, or will Sasha end up bankrupt? Our answers will come in a couple of weeks at the Royal Rumble.